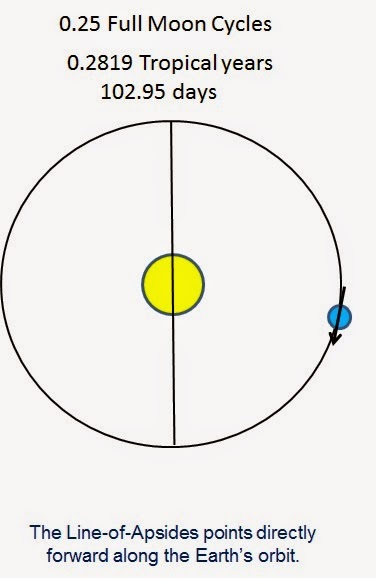 Are the Strongest Lunar Perigean Spring Tides Commensurate with the Transit Cycle of Venus? This study identifies the strongest Perigean spring tides that reoccur at roughly the same time in the seasonal calendar and shows how their repetition pattern, with respect to the tropical year, is closely synchronized with the 243 year transit cycle of Venus. 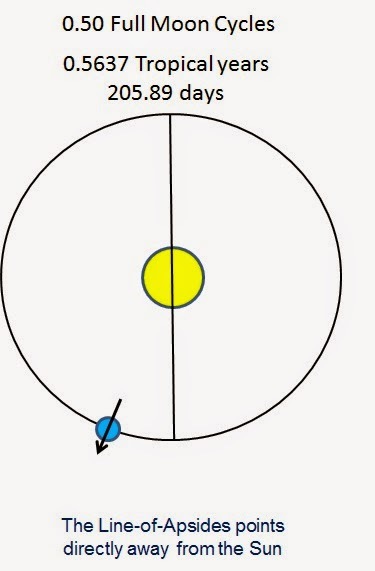 It finds that whenever the pentagonal pattern for the inferior conjunctions of Venus and the Earth drifts through one of the nodes of Venus’ orbit, the 31/62 year Perigean spring tidal cycle simultaneously drifts through almost exactly the same days of the Gregorian year, over a period from 1 to 3000 A.D. Indeed, the drift of the 31/62 year tidal cycle with respect to the Gregorian calendar almost perfectly matches the expected long-term drift between the Gregorian calendar and the tropical year. If the mean drift of the 31/62 Perigean spring tidal cycle is corrected for the expected long-term drift between the Gregorian calendar and the tropical year, then the long-term residual drift between: a) the 243 year drift-cycle of the pentagonal pattern for the inferior conjunctions of Venus and the Earth with respect to the nodes of Venus’s orbit and b) the 243 year drift-cycle of the strongest seasonal peak tides on the Earth (i.e. the 31/62 Perigean spring tidal cycle) with respect to the tropical year is approximately equal to -7 ± 11 hours, over the 3000 year period. The large relative error of the final value for the residual drift means that this study cannot rule out the possibility that there is no long-term residual drift between the two cycles i.e. the two cycles are in perfect synchronization over the 3000 year period. However, the most likely result is a long-term residual drift of -7 hours, over the time frame considered. Figure 13. The red curve in [a] shows the difference (in hours) between the tropical year and the Gregorian calendar year (measured from J2000), as calculated from equation (2) versus the year. 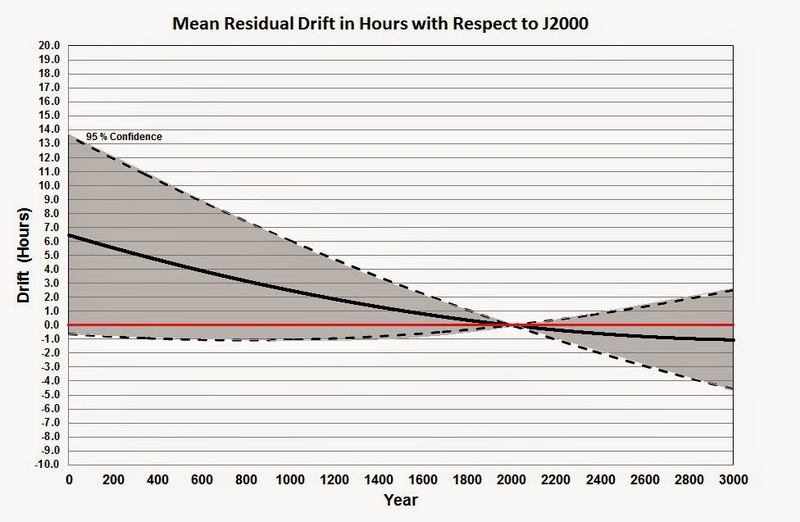 This difference is subtracted from the measured mean drift displayed [a] to determine the long-term residual drift (in hours) versus the year, which is re-plotted in [b]. The ± 95 % confidence intervals for the measured mean drift [a] and the long-term residual drift [b] are displayed – see text for details. This study identifies the strongest Perigean spring tides that reoccur at roughly the same time in the seasonal calendar and shows how their repetition pattern, with respect to the tropical year, is in near-resonance with the 243 year transit cycle of Venus. A single representative time is determined for each of the transits (or transit pairs) of Venus, over the period from 1 to 3000 A.D., in order to delineate the 243 year transit cycle. The representative time chosen for the transit cycle is the precise time of passage of the drifting pattern for the inferior conjunctions of Venus and the Earth (i.e. the pentagram pattern seen in figure 1), through a given node of Venus’ orbit. 1. The first involves finding the date on which the percent age fraction of the circular disk of Venus that is illuminated by the Sun (as seen by a geocentric observer) is a minimum. 2. 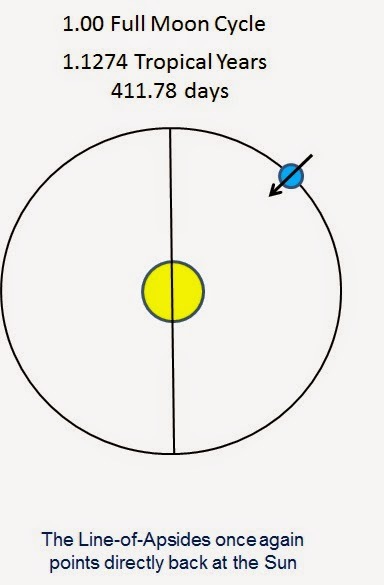 The second method involves using the transits (or near transits) on either side of a given node of Venus’ orbit to determine the temporal drift rate (in solar latitude) for the pattern of inferior conjunctions of Venus and the Earth. This is then used to calculate the date on which the pattern crosses the solar equator. A selection process is set up to identify all new/full moons that occur within ± 20 hours of perigee, between the (Gregorian) calendar dates of the 14th of December and the 11th of January, spanning the years from 1 A.D. to 3000 A.D. This process successfully identifies all of the spring tidal events with equilibrium ocean tidal heights greater than approximately 62.0 cm, over the time interval chosen. These events are designated as the sample tidal events or the sample tides. Four distinct peak tidal cycles with periodicities less than 100 years are identified amongst the sample tides. Investigations of these peak tidal cycles reveal that the 31/62 year tidal cycle is best synchronized to the seasonal calendar, over centennial time scales. Sequential events in this tidal cycle move forward through the seasonal calendar by only 2 – 3 days every 31 years, and the number of hours between new/full moon and perigee (a measure of their peak tidal strength) only changes by ~ 0.6 hours every 31 years. 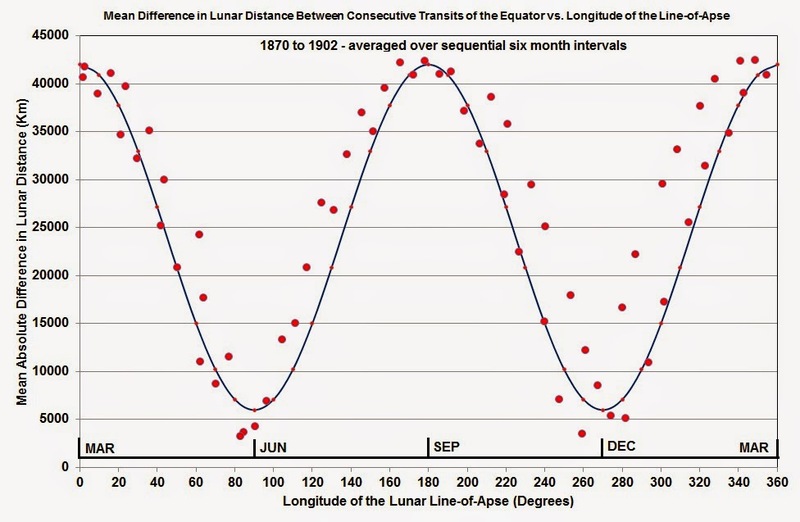 An analysis of the 31/62 lunar peak tidal cycle shows that the sample tidal events reoccur on almost the same day of Gregorian (seasonal) calendar after 106 years, and then they reoccur on almost the same day after another 137 years. This produces a two-stage long-term repetition cycle with a total length of (106 + 137 years =) 243 years. is approximately equal to -7 ± 11 hours, over a 3000 years period. The large relative error of the final value for the residual drift means that this study cannot rule out the possibility that there is no long-term residual drift between the two cycles i.e. 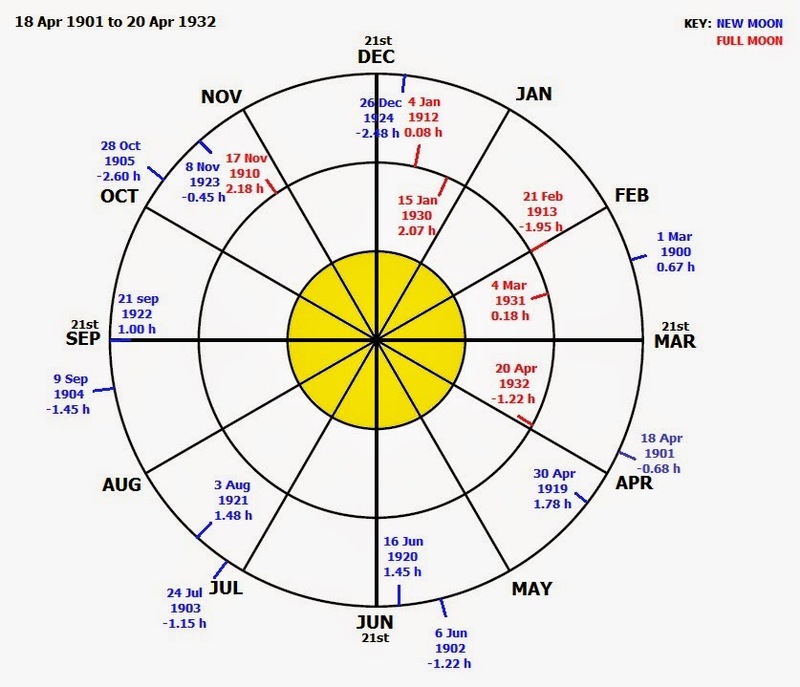 the two cycles are in perfect synchronization over the 3000year period from 1 to 3000 A.D. However, the most likely result is a long-term residual drift of -7 hours, over the time frame considered. Finally, there is one speculative extrapolation that could encourage others to further investigate this close synchronization on much longer time scales. 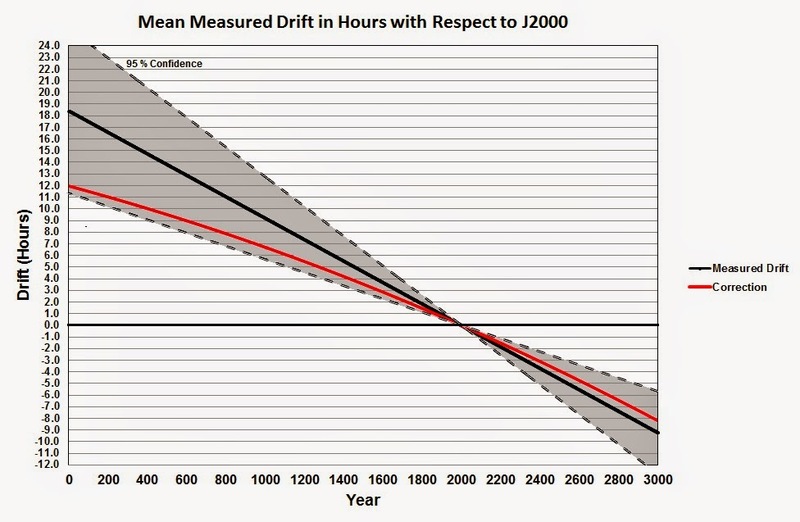 If these future investigations show that the long-term residual drift rate of -7 hours over 3000 years is valid over much longer time scales then this close synchronization may highlight a mechanism that might be responsible for the Earth’s 100,000 year Ice-Age cycle. This comes from the fact that the strongest Perigean spring tides would be in close synchronization with (i.e. ± half a day either side of) the date of the Earth’s Solstice (on or about December 21st) for a period (24/7) × 3000 years =10,300 years. In addition, this close synchronization would be re-established itself after the 31/62 peak tidal pattern drifted backward through the Tropical calendar by ~ 9.7 days (i.e. the average vertical spacing between sequences in figs 12a & b) such that after ((9.7 × 24) / 7) × 3000 years = 99,800 years. Hence, the close synchronization discovered in this study lasts for ~10,000 years, with each period of close synchronization being separated from its predecessor by ~100,000 years. This is very reminiscent of the inter-glacial/glacial period that is characteristic of the Earth’s recent Ice-Age cycles. IV. The triggering mechanism for El Niños: The alignment of the lunar line-of-apse with the equinoxes and Solstices of the Earth's orbit. I . 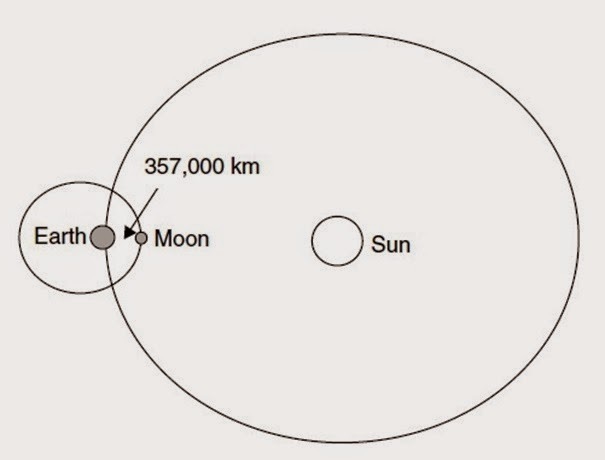 The Changing Aspect of the Lunar Orbit and its Impact Upon the Earth's Length of Day (LOD). II. 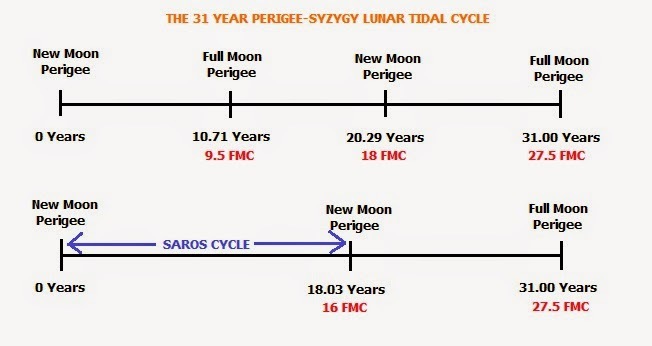 Seasonal Peak Tides - The 31/62 year Perigee-Syzygy Tidal Cycle. III. Strong El Niño Events Between 1865 and 2014. Observations of the Earth rate of spin (i.e. LOD) show that there are abrupt decreases in the Earth's rotation rate of the order of a millisecond that take place roughly once every 13.7 days. 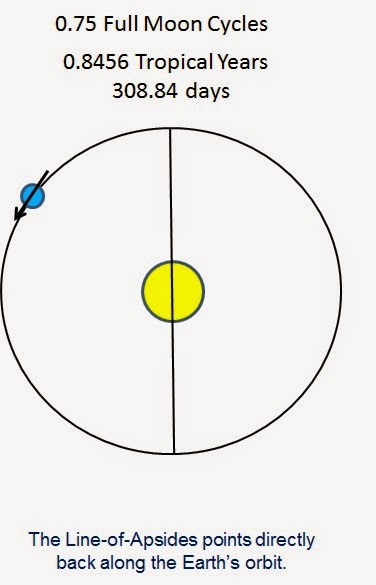 These slow downs in spin occur whenever the oceanic (and atmospheric) tidal bulge is dragged across the Earth's equator by the Moon. They are produced by the conservation of total angular momentum of the Earth, its oceans and its atmosphere. a) The lunar distance during its passage across the Earth's Equator determined the size of the (13.7 day) peaks in LOD (i.e. the magnitude of the periodic slow-downs in the rate of the Earth's rotation). b) The relative sizes of consecutive peaks in LOD were determined by the slow precession of the lunar line-of-apse with respect to the stars, once every 8.85 years. c) In the years where the lunar line-of-apse were closely aligned with the Solstices, the ratio of the peaks in LOD were close to 1.0 and in the years where the lunar line-of-apse were closely aligned with the Equinoxes, the ratio of the peaks in LOD were far from 1.0 (i.e. near either 0.5 or 2.0). These series of posts are based upon the premise that El Niño events are triggered by a mechanism that is related to the relative strength of consecutive peaks in the Earth's LOD (corresponding to decreases in the Earth's rotation rate) at the same point in the seasonal calendar. If this premise is valid, then we should expect to see a pattern in the sequencing of El Niño events that matches that of the 31/62 year Perigee-Syzygy lunar tidal cycle. 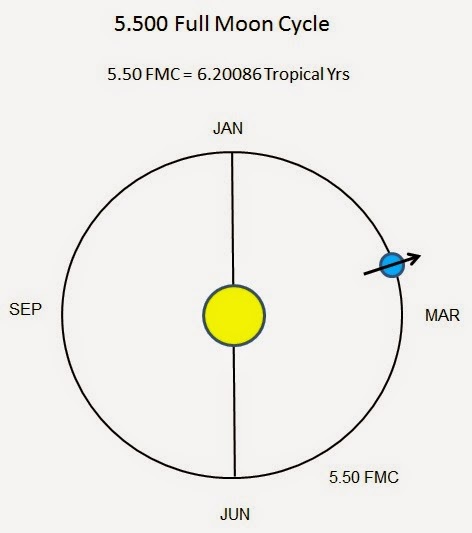 This particular long-term tidal cycle synchronizes the slow precession of the lunar line-of-apse [which governs the slow change in the Moon's distance as it crosses the Equator] with the Synodic cycle (i.e the Moon's phases) and the seasons. 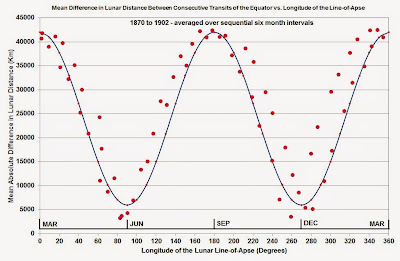 Figure 1 shows the (mean) absolute difference in lunar distance between consecutive transits of the Earth's equator, versus the (mean) longitude of the lunar line-of-apse. Shown along the bottom of figure 1 are the months in which the longitude of the lunar line-of-apse aligns with the Sun. 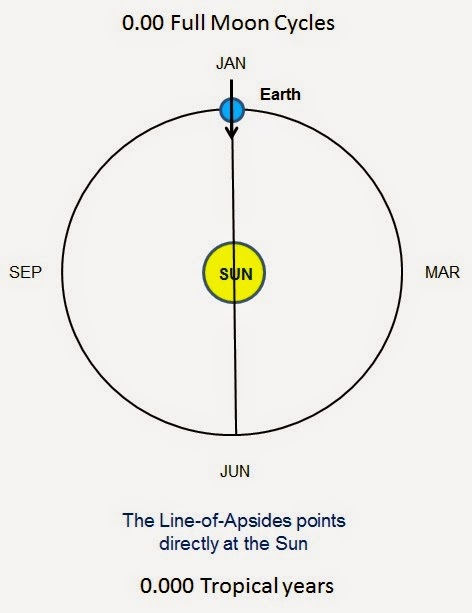 This tells us that the line-of-apse aligns with the Sun at the Equinoxes when its longitudes are 0 [March] and 180 [September] degrees, and it aligns with the Sun at the Solstices when its longitudes are 90 [June] and 270 [December] degrees. Figure 1 shows that if you were to randomly select a sample of six month time intervals during the years from 1865 to 2014, you would expect that they should (by and large) be evenly distributed along the sinusoidal shown in this plot. This means that we are (most emphatically) unable to reject this null hypothesis. of the 31/62 year Perigee/Syzygy tidal cycle i.e. This tells us that we can reject the null hypothesis. Hence,we can conclude that there is a highly significant difference between number of points within +/- 45 degrees of the time where the lunar line-of-apse aligns with the Sun at the Equinoxes, compared to the number of points within +/- 45 degrees of the time where the lunar line-of-apse aligns with the Sun at the Solstices. 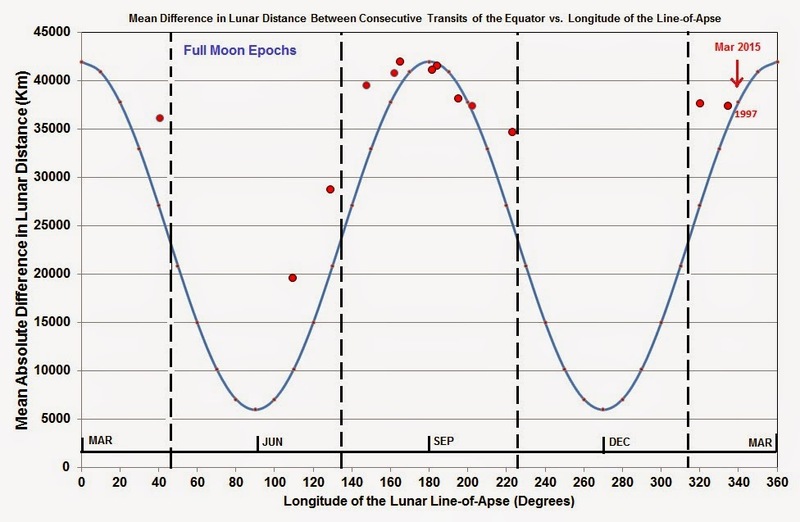 The difference is such that the El Niño events in the Full Moon epochs preferentially occur near times when the lunar line-of-apse aligns with the Sun at the times of the Equinoxes. It is obvious, however, that the robustness of this claim of significance is not very strong, simply because of the small sample size. Indeed, it would only take two extra data points in the +/- 45 deg. Solstices bin to render the result scientifically insignificant [i.e. a chi squared of 3.267 and a probability of rejecting the null hypothesis of 0.071]. Ideally, you would like to have at least double the sample size before you would be a little more confident about the final result. This tells us that we are unable to reject the null hypothesis. However, the El Niño event that has a mean longitude for the lunar line-of-apse of 135.45 degrees in figure 3 could technically be placed in +/- 45 deg. 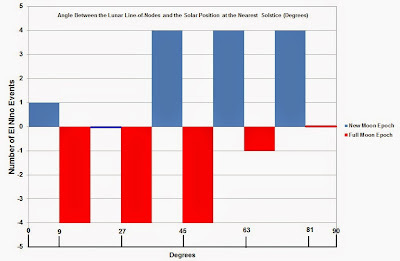 Solstices bin changing the chi squared to 3.769 and the probability of rejecting the null hypothesis to the scientifically significant value of p = 0.052.
compared to the number of points within +/- 45 degrees of the time where the lunar line-of-apse aligns with the Sun at the Solstices. 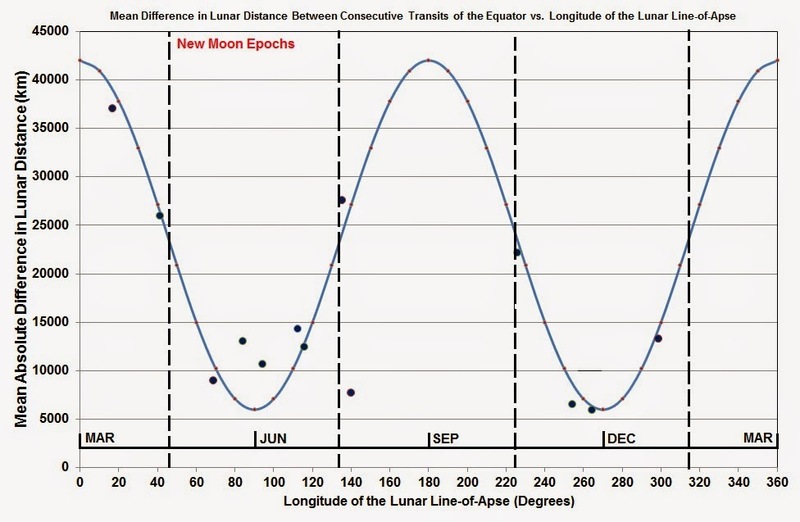 The difference is such that the El Niño events in the New Moon epochs preferentially occur near times when the lunar line-of-apse aligns with the Sun at the times of the Solstices. However, just like the El Niño events in the Full Moon epochs, it is obvious that the robustness of this claim of significance is not very strong, simply because of the small sample size. 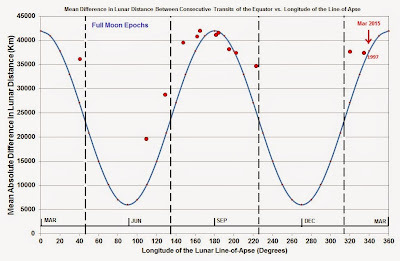 Comparing El Niño Events in the Full Moon Epochs with those in the New Moon Epochs. Figure 4 shows a histogram of the angle between the lunar line-of-nodes and the position of the nearest solstice for all of the 26 El Niño events in the study sample. This angle, by definition, lies between 0 and 90 degrees. The El Niño events have been divided into two sub-samples, consisting of those that are in the New Moon Epochs and those that are in the Full Moon epochs. Solstice for the two sub-samples drawn from the same parent population (= null hypothesis). This can be tested by doing a two-tailed Wilcoxon Rank-Sum Test that compares the two sub samples. preferentially occur near times when the lunar line-of-apse aligns with the Sun at the times of the Equinoxes. 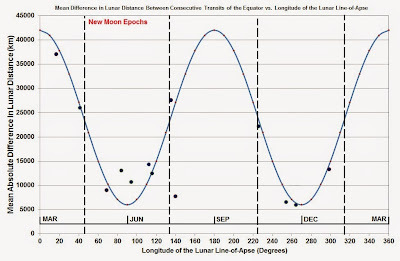 We can now also say that: El Niño events in the New Moon epochs must preferentially avoid times when the lunar line-of-apse aligns with the Sun at the Equinoxes. if fulfilled would reinforce the claim that El Nino events are triggered by the Moon. as these are the years where the lunar line-of-apse aligns with the Sun at the times of the Equinoxes. Of course, there is always the caveat that we are currently moving into an extended period of low solar activity which could increase the overall intensity of El Niño events out to at least the mid 2030's. However, this could also be accompanied by a decrease in the frequency of occurrence of El Niño events as we move into a period of misalignment between the lunar line-of-nodes and the lunar line-of-apse. III. Strong El Nino Events Between 1865 and 2014. [Pdiff] = the long-term average of Pdiff for the month. average is being taken of the parameter in question. use the base period 1971 - 2000]. and maintenance of El Nino events. combines the atmospheric component of the ENSO (i.e. International J. of Climatology, 20 1543-1557.
a 3 or 5 month running mean is applied to both time series. to ensure that we have adequate statistics for our analysis. will be used in blog post IV. year and month of each strong El Nino event. of the El Nino event. of the starting month of the El Nino event. starting month of the El Nino event. criterion because they only last for three months. They have been included in Table 1 for completeness. event has been added as a supplement to Table 1.
for El Nino events that is evident in epoch 2 ( i.e. epoch 6 (1993 to 2002). 9 (and sometimes 4.5) year spacing. the rate of the Earth's rotation). near to the same point in the seasonal calendar. are known as Spring Tides. 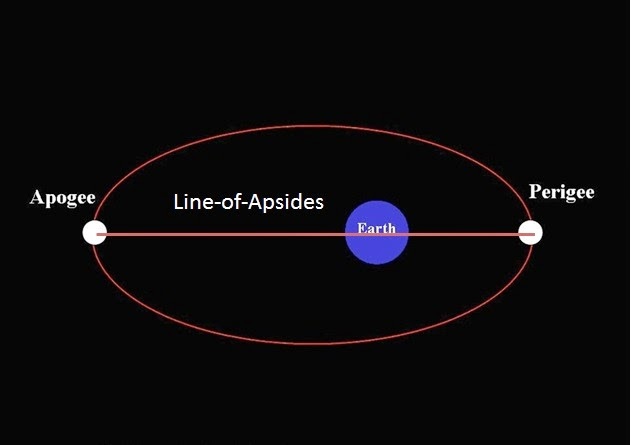 as the Line-of-Apse of the lunar orbit (see figure 1). days (or once every 0.5 FMC - see below). respect to the stars. It is known as the Cycle of Lunar Perigee. line-of-apse after 0.25, 0.50, 0.75 and 1.00 FMC, respectively. means that after five of these time intervals i.e. line-of-apse pointing directly away from the Sun. Sun, it will take twice as long i.e. 62.006 years. achieving re-alignment with the seasonal calender. phases and with the seasons. sequencing of the El Nino events. any given month of the year, over the full 31 year epoch. new and full moon) occur in the southern hemisphere. new and full moon) occur in the northern hemisphere. 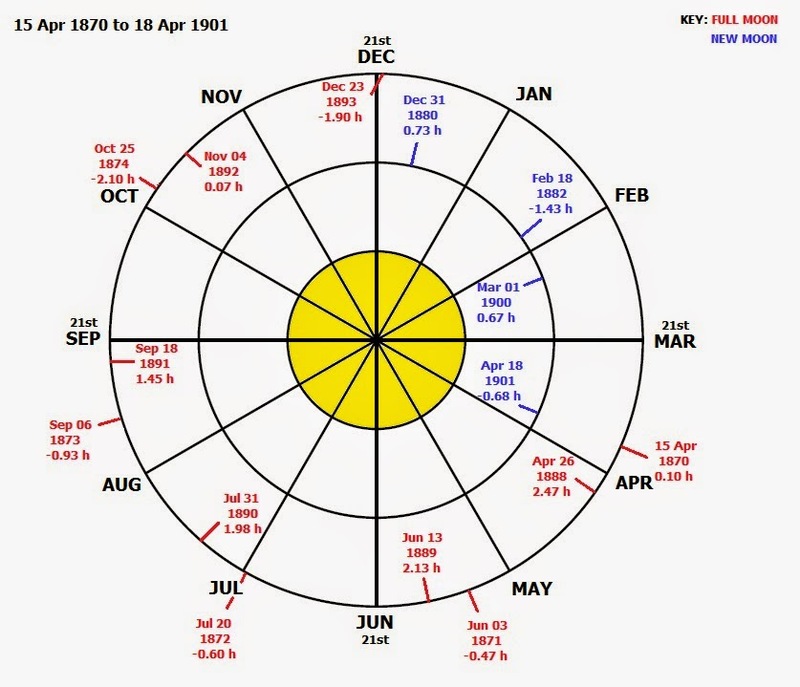 of El Nino events over the period from 1865 to the present.